The South China Sea is the economic heartbeat of East Asia’s future.Approximately 50% of the world’s shipping flowing through its arteries — double that of the Suez Canal and Panama Canal combined. Its development is central to China’s Maritime Silk Road and is crucial to the economies of the region more generally. But amidst great opportunity lies danger in the form of unresolved territorial disputes. A patchwork of overlapping maritime claims between Taiwan, China, The Philippines, Malaysia, Vietnam, Brunei and Indonesia forms what has come to be known as the South China Sea dispute. Aside from the exchange of diplomatic barbs, a code of conduct in the region is still in the works and as such, parties on each side have, in the meantime, resorted largely to unilateral moves and posturing. 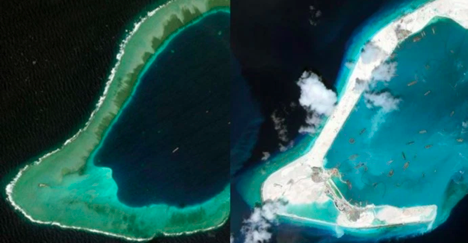 One such recent move is the construction of artificial islands by the Chinese government. In the last 10 years, incidents and activities from all parties have strained the relationship between China, several Southeast Asian nations, and the United States, and a long term solution is still far from sight — certainly, at least, it won’t be found in this article. Over the long term, the addition of artificial islands raises the risk of a sort of island-building arms race in the region. But for now, at least, it does raise new questions for both the region and for international conduct at sea more broadly. But what is an island, anyway? Article 60 of the United Nations Convention on the Law of the Sea (UNCLOS) is clear on this: Artificial islands, installations and structures do not possess the status of islands. An island may not be built and then claimed as territory. Similarly, small atolls, islets, reefs, or any other non-inhabitable rocks in the sea do not qualify as islands and do not extend a country’s territorial waters or Exclusive Economic Zone (EEZ). Neither does a reef that has been artificially expanded into an island. An example of Exclusive Economic Zones across the Pacific. A country’s territorial waters extend 12 nautical miles from coastal baselines, while the EEZ extends 200 nautical miles (Image Source). The Chinese government’s stance has long been that any negotiations pertaining to territorial disputes in the sea are a purely bilateral issue. Regardless of the validity of its claims in the region, this stance is problematic for several reasons: a) international waters in one of the world’s major shipping lanes are affected, and so it is both legally and practically an international issue b) this stance weakens the China’s own objections to similar claims from Japan and other countries (which is based off international definitions) c) China may appear as less-than-forthright, raising the risk of diplomatic isolation, and d) the implications of the current course may set a poor precedent for sea disputes both regionally and globally. Competing territorial claims in the South China Sea. (Source). It is an awkward position, for while China essentially rejects the necessity to comply with the standards established in the UN Law of the Sea, the 12 nautical-mile EEZ they aim to claim is a privilege established by that very law. The islet of Rockall just northwest of Ireland provides a similar historical case. The United Kingdom had claimed an extended EEZ based off this islet since 1955, but ultimately relinquished these claims following its 1997 ratification of the United Nations Convention on the Law of the Sea. It provides a clear precedent that rocks are not and cannot be islands. However, the UK didn’t lose much by giving up Rockall. However, the stakes are much higher in the South China Sea. Another example — one that China in particular has taken exception to — is Okinotorishima, an uninhabited atoll in The Philippine Sea that Japan has controlled since 1931. Japan claims an EEZ (not recognized by the international community) surrounding the islet, and also engaged in land reclamation efforts in the late 1980s in order to prevent the natural erosion of the surrounding reef. In 2004, the Chinese government stated that Okinotorishima was “a rock, not an island” and that it does not acknowledge Japan’s EEZ claim. Within Japan, the atoll’s status became a rallying point for nationalists. Perhaps not surprisingly, domestic proposals to boost their claim included: land reclamation, establishing permanent inhabitants, and building refueling stations — all activities currently employed by the Chinese government in the South China Sea. Climate change further complicates the issue. While it’s clear that islands must be naturally forming in order to extend a country’s EEZ, UNCLOS doesn’t contain any mention of naturally disappearing islands. Sea levels can be expected to rise at least modestly over the coming decades and will swallow many low-lying islands worldwide. By the word of law as it stands, in the event of island becoming submerged, its parent country would also lose the surrounding EEZ. This conundrum has been a major concern to many island states, threatening the very existence of countries such as Kiribati and Tuvalo. It has also prompted solutions from several forward-thinking legal scholars, including freezing current maritime zones, allowing for deterritorialized states, and altering the definition of natural islands to include artificial expansion. The UN Law on the Sea has never been amended, but in the face of rearranging millions of square kilometers of legal jurisdictions, at some point it might need to be. In the case of the South China Sea, many of the low-lying islets and atolls on which China’s claims pivot could vanish in the coming decades. Several already only appear at low tide. This inevitability would further undermine China’s already contested territorial claims, and this might help explain the recent emphasis on land reclamation and island-building in the region. Even if the present island-building is not accepted by the international community at present, the plan is presumably to strengthen its position in the future. While the moves may appear simply an attempt to establish a fait accompli for its claims, it may also be linked with positioning itself for international negotiations down the road. Certainly, if possible, international recognition that is amenable to China’s interests is preferable. Bilateral negotiations, while not necessarily obstructionist, are ultimately insufficient when dealing with issues of international law, for navigation in the South China Sea is an issue all countries have a vested interest in. Regardless of bilateral cooperation between China and Southeast Asian countries, its claims still do not comply with international law. Nor does Vietnam’s island-craft in the region. The same is true for Japan’s activity on Okinotorishima. The biggest danger lies in the situation further degrading into an island-building arms race that will further exacerbate overlapping claims and increase the risk of incident in the region. For the present, far-reaching questions will continue to swell around these lonely rocks in the sea. Older PostWhen Did We Stop Forgetting About Resiliency?